Slice the top quarter off the garlic bulbs. Drizzle about 1 teaspoon olive oil over the top of each bulb and wrap in aluminum foil. Pierce the sweet potatoes with a fork and wrap them in aluminum foil. Place the wrapped garlic and sweet potatoes onto a baking sheet and place in the preheated oven. Bake for 35 minutes, then remove the garlic. Continue cooking the sweet potatoes for another 30-40 minutes or until soft. Remove from the oven and cool. Once the garlic is cool enough to handle, squeeze the individual cloves out of the garlic head into a bowl and set aside. Peel the skins off the sweet potatoes . Place the beans in a large bowl and mash with a fork. Add the sweet potatoes and mash together. Stir in a couple cloves of roasted garlic, the minced garlic, panko, oat flour, egg, and spices. Mix well and refrigerate for about 30 minutes to firm up. While the mixture chills, place the sour cream, remaining roasted garlic, and salt and pepper to taste into a small blender or food processor. Blend until smooth. Heat 2 tablespoons of oil in a large skillet oven medium heat. Use a heaping ¼ cup to scoop out the mixture and form into patties. Place the patties into the hot skillet. Cook for 5-6 minutes, then flip and cook for another 5-6 minutes. Spread a couple tablespoons of the roasted garlic sauce onto each hamburger bun. Top with a sweet potato patty and avocado slices. These sound delicious! My little girl is a sweet potato queen! I love sweet potatoes! Garlic? Yes please! I'll definitely have to try this over the weekend! 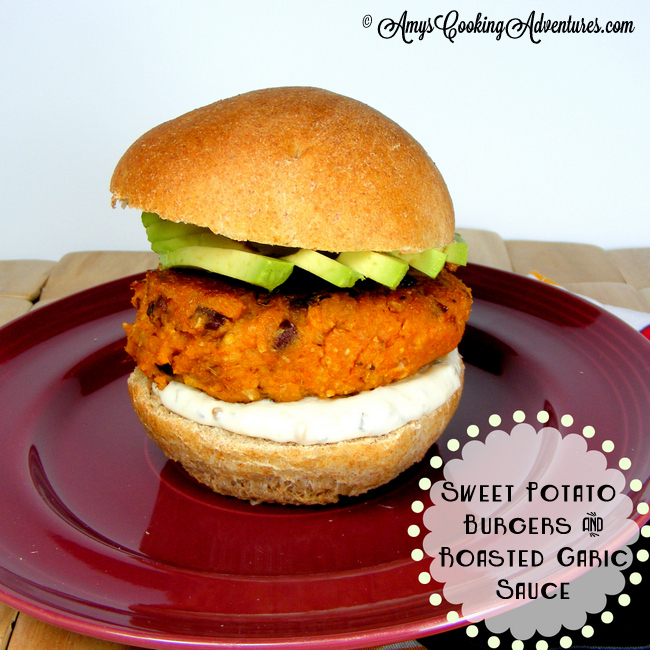 I adore sweet potatoes, but have never thought to make them into veggie burgers. I have to try this!! I adore sweet potatoes, but have never thought to turn them into veggie burgers. What a great idea! Just discovered your blog, I love it and this recipe looks tasty! What can you substitute for the oat flour? you can use your preference of flour in place of the oat flour...all purpose, whole wheat, ground flax - the sky's the limit! Sweet potatoes are a little bit of heaven.. what a great recipe!